A guitarist is only as good as the dedication that’s put in. The instrument itself is important, but there are many that can make beautiful music with the cheapest of instruments. The backbone of a musician is correct tuning, timing and talent. While BOSS may not be able to do anything about an artist’s talent, they can do something about tuning and timing. 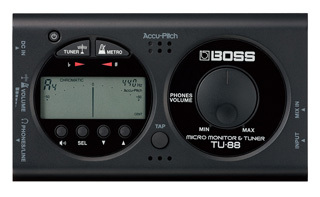 This is all rolled up into one convenient package called the BOSS TU-88.